It can be SOOOO frustrating. You pour your heart and soul into each blog post and yet no one's reading them. Maybe your Mum and a few trusty friends but that's about it. Where IS everyone?? Ok, so I may be stating the obvious here, but it's worth doing because this is THE most important tip that I'll include in this post. I'm afraid it's not a quick and easy 'hack', it's just plain old hard work and diligence. When it comes down to it, there are loads of ways you can drive people to your website, but if your posts aren't of value then people won't bother to click, and if they do, they sure as heck won't come back. Quality is ALWAYS BETTER than quantity. It's so much more worthwhile to publish one value-filled post per week then two or three trashy posts which aren't worth the 10 minutes you took to bang them out... The internet is filled with blogs and bloggers - yours must stand out to have long term success. Before setting up my coaching business, I worked in email marketing. I loved it, but was often frustrated by the fact that it didn't matter how amazing the email copy was, if the subject line wasn't great, no one would open it... The same goes for your blog traffic. If your headlines don't hit the mark then the post itself is pointless because no one will read it. Harsh, but true. SEO stands for Search Engine Optimisation and basically means that when you write a post, you need to think about how easy it will be for someone to find it on Google. I'm no SEO expert, but I've learned the basics and you can too. Firstly, I highly recommend a WordPress plugin called Yoast which will guide you through the key SEO elements you need to consider with each post. ​You just choose your key words (the words that you think people will search to find your post) and Yoast will tell you how to do the rest. Outbound links actually improve your SEO but that's not the only reason it's made this list. There are two other great reasons to include outbound links in your posts. Firstly, it adds value. You're not only giving your readers your own thoughts and expertise, but you're sharing something additional that you've found interesting or useful elsewhere. There are a couple of ways you can do this. Where appropriate, look through your posts and include links to relevant previous ones within the copy. For example, if you're writing a post about your latest cookie recipe then it just makes sense to reference and link to your other cookie recipes, right? Another option is to include links to previous posts so that if a reader enjoys your blog, they can easily move from one post to another. This means a better user experience for your reader and more blog traffic for you! 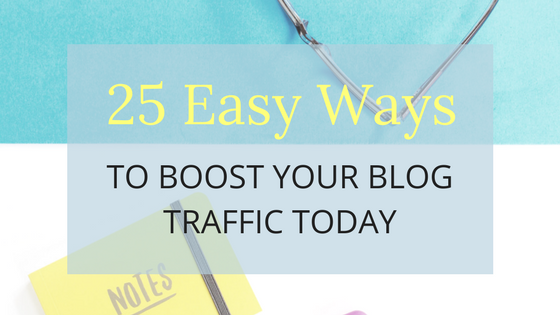 This is a great one for both boosting your blog traffic but also for building an email list. Offer additional resources that your readers can download and takeaway. This provides more incentive for them to click on your link and take a look at your post. They don't just get to read your great insights but they get a fab little freebie too! What's not to love? Want a step-by-step checklist telling you how to plan, write and promote your blog posts? Subscribe now and I'll email one right over to you! Ok, this is all about staying fresh. Just because you had success with that list post last month, doesn't mean that EVERY post should be a list. Your readers will soon get bored, your content will feel stale and you'll start to feel like a list building robot. Your readers want to know what they can expect from you but they also need to be kept interested, intrigued and eagerly anticipating your next post. This can be a great way to keep your readers returning for more. If you have an idea for a post that looks like it's going to be super meaty, then why not break it down into installments? This allows you to perhaps go into more detail for each section without fear of your post becoming too 'War and Peace' like. Hopefully each instalment will entice your readers to come back for the next one. Plus, once all are published you can use tip number 5 and make sure each one contains links to the others so that future readers can easily find them all. Suddenly, you've got a reader hitting your site and visiting 4 or 5 pages rather than just the one. Boom! This is another biggie. Whether you love social media or hate it, as a blogger you HAVE to get involved! It can be very easy to think that once you've finished your post and hit the publish button, your work is done. Now you've got to promote it, promote it again and promote it some more. Social media is where it happens and if you're not on it then you're missing out BIG time on blog traffic opportunities. Don't feel like you need to be active on every single social channel but try to build a decent following on at least a couple. With over 1.86 billion monthly active users, Facebook is hard to ignore, but if your blog is image focused then definitely consider Pinterest and Instagram too. Then, every time you hit publish on a post make sure you share it on social media too. This probably seems a bit hypocritical after I told you so vehemently to 'mix it up' in point 7. I'm not losing it though, I promise. People like familiarity. When they read your posts it should feel like popping on a comfortable pair of slippers. What do I mean by that? I'm talking about your tone of voice, your turn of phrase, even how you lay out your posts. In a nutshell, I'm talking about your brand. If this is completely random each time then it will be confusing for readers and often a bit disappointing. That lovely warm tone in your last post that made them come back for more has suddenly changed and now they don't feel like they know you at all....booo! Yes, yes, I know I'm sounding crazy again. I want you to 'mix it up', then I want you to 'be consistent' and now I'm telling you to 'be different'? In this instance, I'm talking about being different to everyone else. With so many blogs out there it can be very easy to fade into the background and just sound like white noise. In marketing it's called your unique selling point (USP) and essentially, it means you need something that makes you different. Something that makes you stand out from the crowd. Have a think about what that might be for you - it could be your niche, the style of your posts or just your wacky personality. Whatever it is, make sure it's authentically you because people will see through a phony in the blink of an eye. A whole bunch of the points that I've made so far all relate to your brand. It's what helps you to be consistent, it's what makes you stand out from the crowd and it's what will help you to keep your writing and your blog focused. If you're not sure what your brand is, then in a nutshell, it's you. Have a think about how friends would describe you (or better still, ask them!) and then relate that to how you want your blog or business to make your readers and customers feel. It could be that you're a relaxed person who is really big on family and a bit of a nerd. Let that shine through in your brand. It should be apparent in the look and feel of your blog, your pictures, your tone of voice - everything. It's ok, I'm not banging on about social media again - well not specifically anyway. This time, it's all about being social in general. Blogging is all about connecting with people. Connecting with your readers, obvs. But also, connecting with other bloggers! Get active in the Facebook groups, the forums, the Twitter chats. Go out, meet people and make friends. Read other blogs, leave comments and interact. If you leave an insightful comment on someone else's post, then they and their readers may decide to pop over to your blog to take a look! The more of a community you have around you, the more support you will have during the hard days when you feel like giving up and the more friends you'll have patting you on the back when you have a good day. In a nutshell, the point of your blog (assuming you're using it as a platform rather than a personal notebook) should be to help your ideal readers. Whether it be showing them how to do something, providing them information on their favourite subject or just entertaining them for a few minutes. Whatever it is that your ideal readers are coming to your blog for, you need to make sure that you're providing it in bucket loads in each post. There are some great tools out there which will help you to find out the types of questions that your readers might be asking. I recently discovered a site called 'Answer the Public' - go take a look and get some inspiration on how you can be super helpful to your readers. If you want people clicking on your blog and coming back again and again to see what you've got to say, then you have to make them believe that you know what you're talking about. You have to be credible. This can be particularly tricky when you're just starting out and you're still trying to prove yourself. People will often look at things like your social media following and the number of comments on your posts. These all add to your credibility because they show that other people think you're worth reading and following. While you're still building your online community, you need show your credibility in other ways. Your blog itself is a huge flashing sign of credibility (or not, as the case may be.) If it looks professional, well branded and designed then your readers will automatically get a good first impression. Consistently great content will also increase your credibility as you begin to grow your thought leadership in your particular subject area. Testimonials are a FANTASTIC way to give you credibility. It's all very well YOU telling everyone what an expert you are, but if you can show other people singing your praises then that's a hundred times more powerful. When you're just starting out then guest blogging is a brilliant way to drive a bit of traffic to your fledgling blog. Jon Morrow goes as far as advising newbie bloggers not to bother posting at all on their new site until they've got several guest posts under their belt and so a reasonable sized audience before they hit publish for the first time. I know I've already gone on about social media quite a bit but I thought this was worth a point all on its own. Facebook groups are a great way to meet other bloggers, give and get support and, of course (or it wouldn't be on this list), boost your traffic. Even better than joining Facebook groups is setting one of your own up! This helps you to create a community of your own, build that all important credibility and adds another platform for you to promote your thang. Free Facebook Group: Join Business Class today! If you want to join a FREE group of like-minded hopeful entrepreneurs who are building a biz so they can quit their 9-5 for good and spend more time doing the things they love, then come on over to my Facebook group, Business Class. You'd be most welcome! You may be wondering how on earth reading someone else's blog will increase YOUR traffic. There are a couple of ways in fact! Firstly, by reading more blogs you will grow your own knowledge and blogging repertoire. You'll get ideas, learn new ways of doing things, keep up with current trends and in so doing, improve your own blogging abilities. Reading other blogs also allows you to get involved with the community. Comment on what you've read about, share the ones you loved and before you know it, you'll have people coming back to your blog to comment and share your stuff too. I love to write. I've always loved to write. In fact, for as long as I can remember, I've wanted to be a writer. I started a diary when I was 11 and I wrote in it every day - sometimes more than once a day. I wrote letters to people. Pages and pages of 'em. I wrote poems and short stories and as soon as I discovered that I could, I started a blog and wrote some more. My point is, I write a lot and always have, but during the times when I haven't, when life has gotten too busy and other things have taken over, I've noticed a difference. Suddenly, when I start writing again, it feels a bit trickier, my writing doesn't seem to flow as much as it did and it doesn't come as naturally. The reason for this is that like any skill, writing takes practice and regular use or it starts to get rusty and stiff. The more you do it, the easier and more natural it feels. Your style will develop and grow and before you know it, you'll be a better writer. Oh maaaan - I'm at it again. Banging the old social media drum! Hopefully, I've made my point that sharing your stuff on social media is a vital part of driving traffic to your blog. However, what a lot of people miss, is that you can share stuff more than once! In fact, you can (and should) share it a LOT. You don't have to shove it down people's throats but there's definitely a happy medium between that and just sharing something once and then letting it settle at the bottom of the blogging ocean, never to be seen again. Your social sharing strategy should be a mix of promoting your new work, but also re-sharing your older stuff for people who missed it the first time. If your blog is part of your business then it can be really tempting to just use it as another form of sales pitch. The thing is, people don't read blogs to be given a sales pitch and if you try it, they'll probably be pretty hacked off and they probably won't come back. Yes, blogging can and should be used for marketing, but it's about the long game. It's about building trust and credibility with your readers by providing valuable, free and non-salesy content. Enough of the good stuff and you won't need the sleazy pitch to sell your stuff - your customers will want to buy it already. Your ideal readers are the people you should be writing for. They're the people who are desperately searching the web for something exactly like YOUR blog. They need the info you're sharing, they love the style you write it in and given half the chance, they'll become a fan AND a customer of yours. Wouldn't it be amazing if you could find a load of people like that? Does it sound too good to be true? It's not - I promise! You just have to have a really clear understanding of what kind of person is likely to be your ideal customer. If you're writing about cheap ways to feed your family, then your ideal customer is going to be a parent who is watching their pennies. Actually, you should be even more specific than that - the more detailed the better. Once you have that clear vision of your ideal reader then everything you do and everything you write about should be with them in mind. What problems are they facing? What are their biggest dreams, goals, fears? How can you provide solutions? Oooh, this is an important one. The second that blogging starts to feel like a chore, it will show in your writing and that's not good. In the last point, I told you to remember your ideal readers. Equally important is to write about something that you feel passionate about too. What would you rather read? An account of how to make a chic table out of egg boxes that's lack lustre and emotionless or one where the writer's enthusiasm bounces of the page (or screen)? ​If you're not enjoying yourself then ask yourself why and do something about it. When you're first starting out it can be quite scary. You're not sure if you're doing it right or if you're good enough. So you look at what everyone else is doing. You find the influencers and the success stories and you try to emulate them. That's fine. In fact, it's a great strategy. Study your competitors. Learn from the people who have already been doing it for years and incorporate what you can into your own blogging. What isn't fine, is copying someone else and trying to BE them. Take those great ideas and make them your own. Add your own unique style, your own personal twist. The fact is, no matter how hard you try to be someone else, you'll only ever be a second rate version. Much better to be a first rate version of you! You've made it to the last point! Well done. You can give yourself a big pat on the back because it means you're already educating yourself. Whatever your niche is, read everything you can find about it. Some of it will be great, some of it will be awful but the more you read the better you'll get at telling the difference. Don't just read about your niche though. If you want a successful blog and business then you should also be reading about marketing, running a business, managing your time and all those other key skills that are required to be on top of your game. Read books, blogs, articles. Get coaching, sign up to webinars, online courses - anything that your time and budget allows. By doing this you'll stay fresh and relevant and you'll always have something interesting to write about.